Profit from the Pegasus Bonus, Once Bitten Bonus, Pick Me Bonus and so much more on Medusa slots. Test your luck on the most popular slot game. 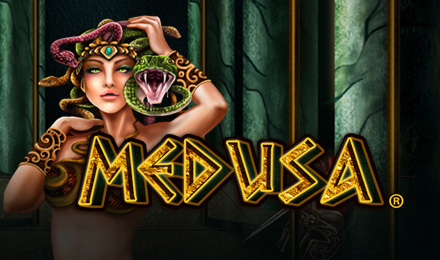 Medusa slots, themed on the Greek gorgon Medusa, is a 5 reel and 25 payline. Wilds, super spins, expanding wilds, re spins and pick a symbol feature are all inclusive on this game. The Once Bitten Feature is activated by landing three or more Medusa logo scatter symbols. Receive 10 free spins and all your winnings are doubled. The Pegasus Bonus Feature allows you to pick a prize where you can win up to 50x your stake bet. Look out for the Wild Medusa symbol that turns one of the three middle reels to stone and will award three respins.